Genus allegedly native of Opos, botanical Latin name of an ancient Greek village near Locria on the coast of Euboea (or Evia), Opountis in Greek, known for the presence of many spiny plants (except Opuntia). Opos is also mentioned in the Iliad. A genus of shrubby to treelike plants, often with a distinct trunk, divided into segments (cladodes), mostly flattened, discoid, elliptic or elongated, rarely cylindrical. Tiny leaves, cylindrical or subulate, soon deciduous. Areoles with glochids and hairs; spines aciculate, subulate or setose, sheath absent. Flowers diurnal, often self-fertile, rotate to wide open or elongated and narrow (in Nopalea), appearing on the margins of cladodes, usually solitary, pale to intense yellow, orange, red, carmine, pink, purple, sometimes whitish, or bicoloured, usually pollinated by bees: Andrenidae (Acamptopoeum prinii, Andrena fracta, Anthrenoides micans, Arhysosage cactorum, Calliopsis helianthi, C. puellae, Callynochium petunlae, Perdita sp., Psaenythia annulata, P. superba), Anthophoridae (Ancyloscelis fiebrigii, Anthophora californica., Diadasia sp., Ceratina asunciana, C. hyemalis, C. rupestres, C. volitans, Lanthanomelissa completa, Melissodes, Ptilothrix fructifera), Apidae (Apis mellifera, Bombus sonorus, Centris atripes, C. caesalpiniae, Ceratina melanoptera, Diadasia diminuta, D. opuntiae, D. rinconis, Melissodes paroselae, M. tristis, Plebeia emerina, P. wittmannii, Xylocopa californica), Colletidae (Cephalocolletes rugata, Colletes scopiventer, Hylaeus episcopales), Halictidae (Agapostemon angelicus, A. cockerelli, A. tyleri, Augochlora semiramis, Augochlorella neglectula, A. pomoniella, Augochloropsis euterpe, Dialictus sp., Halictus ligatus, H. tripartitus,Lasioglossum amicum, L clematisellum), and Megachilidae (Anthidiellum notatum, Anthidium jocosum, Ashmeadiella cactorum, A. clypeodentata, A. leucozona, A. meliloti, A. occipitales, A. opuntiae, A. vandykiella, Atoposmia anthodyta, Dianthidium curvatum, D. heterulkei, D. parvum, Lithurgus apicalis, L. rufiventris, Megachile frugales, M. odontostoma, M. sidalceae, Osmia subfasciata), also by hummingbirds (Amazilia luciae, A. rutila, A. tzacatl, A. violiceps, Archilochus colubris, Atthis eliotii, A. heloisa, Calothorax lucifer, Calypte anna, Cynanthus latirostris, C. sordidus, Heliomaster constantii, Selasphorus rufus), sometimes pollinated by bats (Choeronycteris mexicana, Glossophaga soricina, Leptonycteris yerbabuenae). Flowers (except those of Nopalea) have sensitive stamens (thigmonasty or seismonasty). Fruits more or less globose, fleshy or dry, umbilicate, usually garnished with glochids in the areoles, indehiscent. Seeds sometimes numerous, variable in size, very hard, flattened, discoid to kidney-shaped, white to brown, with a funicular enveloppe, glabrous or pubescent. Dispersal of seeds insured by small mammals and birds, also reptiles (eg. the tortoises and iguanas in the Galapagos islands). 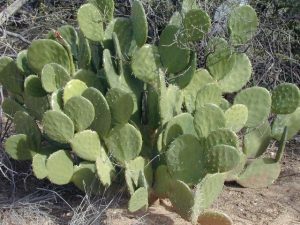 The genus Opuntia has a huge geographic distribution, the number of species is one of the largest within the family of Cactaceae and furthermore, some of them (eg. O. engelmannii, O. phaeacantha, O. polyacantha…) are highly variable. It is found from Canada, down to Patagonia and throughout the Carribbean Islands. It occupies practically all habitats, eg. the typical chaparral of the southwest of the United States and northern Mexico, but also on alluvial plains and rocky cliffs, on rocky, sandy or gravelly soils, on volcanic rocks, among grasses, bushes and scrub, on dry rocky hillslopes, on the edge of canyons, also in open grasslands (in Missouri), regions of woody high plains, in forests of junipers (Juniperus spp.) and pines (Pinus spp. ), in regions sometimes covered with snow in winter (O. fragilis, O. humifusa, O. polyacantha), from sea level up to 4100 m in altitude (O. sulphurea), in a plant association essentially composed of cacti and other succulents. countries (South Africa, Australia, Botswana, Spain, the Canary Islands, Italy, India, Morocco, Yemen, etc.). – Opuntia aequatonalis* Britton & Rose 1919 (= prob. hybr. between O. pubescens and O.